reptans is a popular choice for living roofs in temperate and subtropical parts of the world. 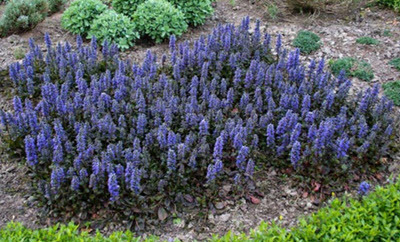 As a sprawling perennial herb it provides a dense ground-cover, and it is also a very pretty plant with its strong purple flowers produced on tall stalks. Once established, the plant will spread through runners sent out across the roof. A. reptans is native to Europe where it grows in woods and on rough pastures, but it has been introduced by man to many other parts of the world, including North America where it thrives. The plants grow to a height of 10-35 cm. The hairless leaves are dark green with purple highlights. They grow to be 5-8 cm in length, and the shape can be elliptical or ovate, with a rounded tip. In spring, the plants send up 10-15 tall erect stalks on which the flowers develop. The infloresence forms a dense raceme with whorls of bluish or purple flowers sporting dark veins on the lower lip. The calyx has five toothed lobes and the corolla forms a two-lipped flower which can be up to 17 mm in length. There are two long and two short stamens – all longer than the corolla. Planting Blue Bugle may attract butterflies to your living roof, especially if you live in an area where there are Pearl-bordered and Small Pear-bordered fritillary butterflies. The former is widespread throughout Europe, from Scandinavia to northern Spain, and from Ireland in the west throughout Russia in the east. Its smaller relative is widespread across central and northern Europe, North America, and through Asia to Korea. Both of these butterfly species are threatened by the disappearance of traditional flower-rich meadows.